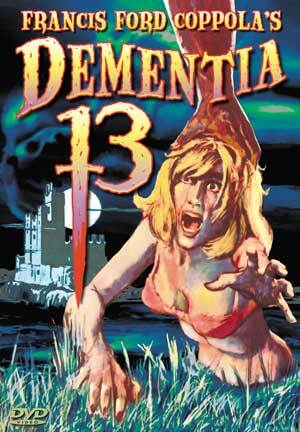 The aforementioned tagline might be exagerating things a little bit, DEMENTIA 13 nevertheless is a true cult classic. After THE TERROR (starring Jack Nicholson and Boris Karloff), DEMENTIA 13 was Francis Ford Coppola’s second collaboration (as a feature director) with legendary producer Roger Corman. Shot on a very tight time-schedule, the result is a very tense, dark and disturbing psychological thriller. Using the same sets of Corman’s THE YOUNG RACERS, the film was entirely shot in Ireland with Jack Hill joining the project as a second unit director and co-writer.